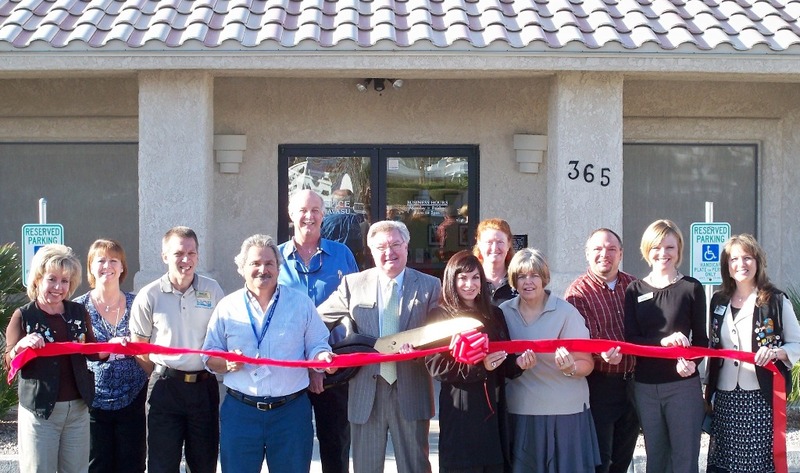 The Lake Havasu Area Chamber of Commerce Ambassadors held a ribbon cutting for Hospice of Havasu’s 15 year anniversary as a member of the Chamber of Commerce and its 30th year anniversary as a business in the community. Hospice of Havasu is a not-for-profit agency helping patients and families in Mohave and La Paz counties at the end of life. The agency was founded in 1982, and has become one of the largest hospices in rural Arizona. Featured in the photo from left to right are; Chamber Ambassador Kathy Baumer, Shelley Hert, Ross Johnson, Chuck Scovone, Adrian Farmer, Annette Wegmann, Mary Lomberto, Mike Lerch, Sarah Messmer and Chamber Ambassador Amy Sugamele. For more information, please contact (928) 453-2111.